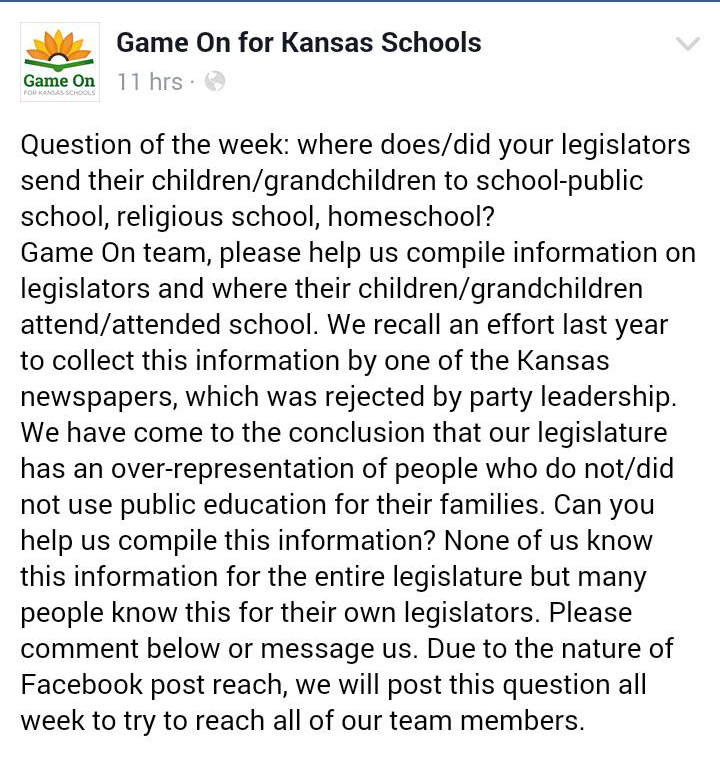 So, I know we're supposed to be all bent out of shape about a Facebook effort from GameOn Kansas Schools. This drum circle started in Prairie Village, so the looniest land in all of Johnson County. At some point this weekend, this group of leftist hippies took a break from blocking chicken joints and in their neighborhoods to post to Facebook inquiring where Kansas legislators send their kids to school. Grassroots conservatives are upset that this group wants to somehow target children to advance their message or something. Conservatives are calling it "threatening." I really don't read it that way. I don't really like to give anyone in politics the benefit of the doubt, and I certainly don't like to give liberals the benefit of the doubt. However, I understood the call to action to mean GameOn (SUCH a stupid group name) is seeking general information -- not specific. It sounds like they're asking for their supporters to report whether their legislators' children attend public, private or homeschool. And I know I risk being skewered and burned at the stake, but I think that's a relevant question. 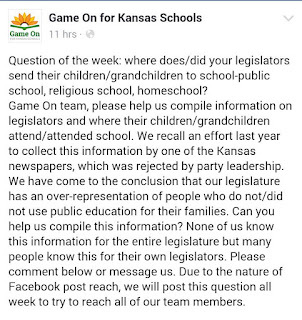 Personally, I think it will backfire on the GameOn folks -- not because the topic is out of bounds, but because the vast majority of legislators' kids attend public schools. And the few who home school or send their kids to private schools are clearly smarter than those who don't. It's a point in their favor. If GameOn is truly seeking to intimidate children or to somehow threaten, I take this post all back. But I just don't read it that way. It doesn't make sense for conservatives to pretend that family situations are off-limits. They aren't. Or shouldn't be. I'm never going to support Newt Gingrich or Bill Clinton for local dog watcher or anything else, because of their family situations. How a person runs his or her household typically paints a very clear picture of what he or she values. It's relevant. If you can't keep promises to your family, I don't know how we, the people, can trust you to keep promises to us. How legislators educate their children is relevant. I think it's relevant when Barack Obama rips school vouchers out of the hands of poor children while sending his own kids to the poshest of elite private schools. If GameOn starts mentioning specific schools or children or addresses, then by all means, get indignant. But until then? I think the anger on the part of conservatives is misplaced. 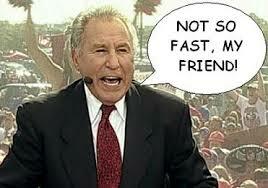 Sorry friends. Side note: I know this and this happened. I'll unpack these today or tomorrow. Must now do the kind of work that pays the bills.